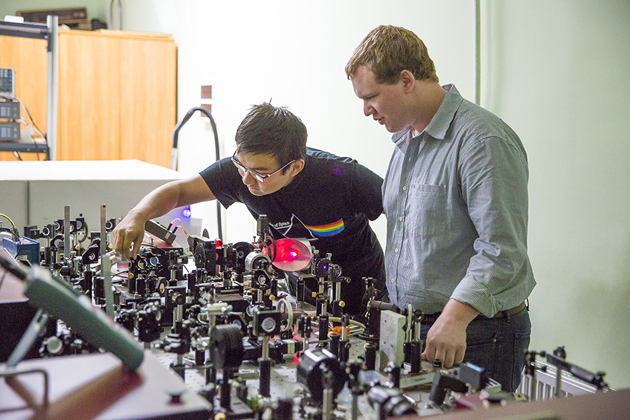 Kaia Williams and Yang Deng in a lab at the International Institute of Photonics and Optoinformatics (ITMO University) in St. Petersburg, Russia, while recently attending the Summer School on Photonics there. Rising sophomores Yang Deng, Kaia Williams and Lei Ding and rising seniors Tyler Berryman and Guntis Rutins also participated. This trip was partly supported by The Institute of Optics, the Hajim School of Engineering and Applied Sciences, and ITMO University. Dan Smith, the undergraduate program manager at The Institute of Optics organized this trip from the University of Rochester side. Prof. X. C. Zhang, Director of The Institute of Optics, met the students in St. Petersburg before they entered the lab to start their research projects. Svetlana Lukishova, a Senior Scientist at The Institute of Optics who joined the students in St. Petersburg, said they carried out research in such fields as generation and analysis of terahertz radiation in femtosecond laser-induced plasma and in graphene, diffraction of a terahertz radiation on a dielectric cuboid with producing a terajet, and sub-carrier-wave quantum cryptography with different single-photon detectors for telecom wavelengths. Williams, for example, studied the generation and detection of terahertz waves using a femtosecond laser. Like Lee, the rising sophomore hadn’t had all that much experience in a lab setting “so being able to work in a lab and do research was a great experience,” he said. At the end of the school each student delivered a 15-minute power point presentation about their research and submitted 5-page reports. Guntis Rutins and Lei Ding answer questions after their talk on quantum cryptography at the final session of the ITMO Summer School. Lukishova praised the dedication and enthusiasm of ITMO faculty and staff who conducted the school. “They even worked with our students during three days of a Russian official holiday,” she said. In addition to their research, students also had lessons on Russian language, history and current events; attended scientific lectures; toured the city; visited the Peterhof (Peter the Great’s “Russian Versailles”), the Hermitage museum of fine art and culture, and the Russian Museum (the museum of Russian fine art); and attended a ballet in Mariinsky Theatre. Lee said her most memorable experience was going on a midnight boat tour to watch the raising and lowering of bridges to let ships pass in and out of the Baltic Sea into the Volga-Baltic waterway system. 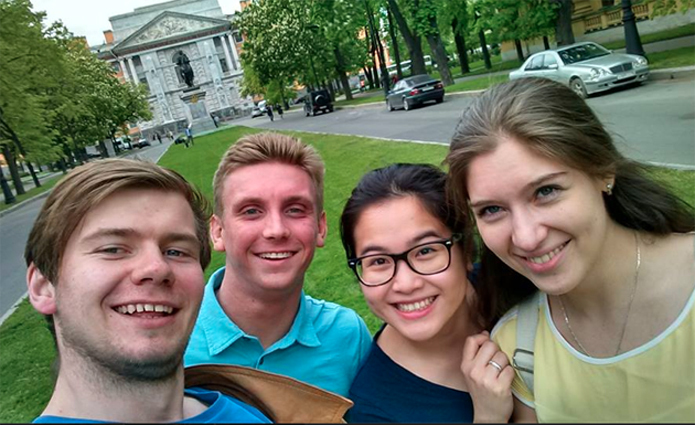 Tyler Berryman, second from left, and Sze Wah Lee, second from right, with two Russian students they met in St. Petersburg.